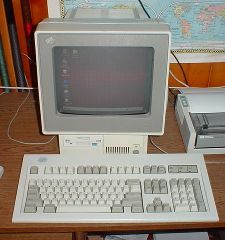 I run Windows 95 as the operating system of choice for this machine. It works very well and the IDE (though problematic on a Model 53) has worked perfectly under protected mode control. The system makes an excellent MP3 player for the back room with WinAmp software. Folks, this is it. The much sought after Reply Corporation upgrade planar for the IBM PS/2 Model 25 and Model 25-286 systems. 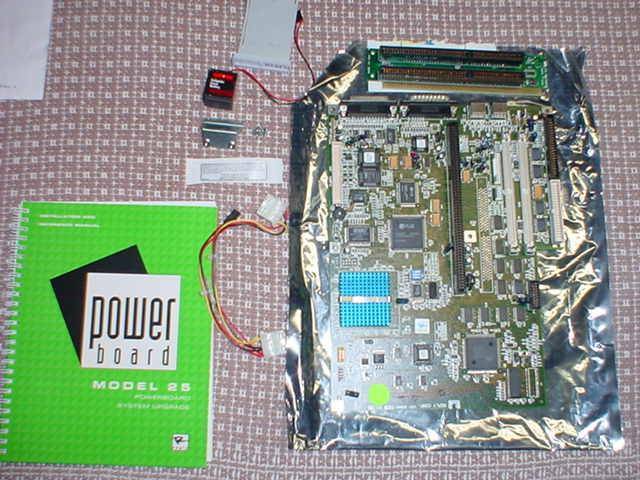 This board gives you the most performance you can cram into a Model 25, with up to an Intel 486DX4 100MHz CPU. There is nothing higher. Thanks to Bob Watts for putting one up for sale complete with manual and all installation parts. I never, ever, thought I would find one. I'd highly advise getting the manual at the very least to perform the Reply upgrade planar installation. Having all of the items needed to do the upgrade is not really required--all you really absolutely need is the planar, floppy disk cabling and the riser. A floppy "cable converter" is included with a "new" Reply board, but I didn't have to use it in any of the install scenarios I tried. I will at some point, though probably not soon, be publishing a guide to installing the Reply board, as well as the PC Enterprises Genesis board. I have two known attempts to use non-Intel upgrade CPUs on the the Reply Model 25 Powerboard. The first attempt (using a Kingston TurboChip) by David Beem did not succeed. The planar wouldn't even do POST. The planar doesn't have a POD style 486 socket, so using a Pentium Overdrive chip is not an option. It looks as though the planar tops out at 100MHz, but even then that's a big improvement from whatever your Model 25 had beforehand. My own attempt with an IBM 5x86 CPU at 100MHz--the system powered up and would display the BIOS copyright, but it froze after that. I suppose that possible CPUID difficulties are the cause of David and I's trouble with non-Intel CPUs. Purpose of U4? It's a place you can put additional VRAM. Reply seems to have done this on all their boards--they have left this set of pads empty. I would think another 512K VRAM chip at this location would give you a nice 1MB of VRAM, enough to run high color modes with, but nothing beyond 640x480 at 60Hz!!! *Well, almost. A company by the name of PC Enterprises marketed a board known as the Genesis\PC. It's a totally different board than the Reply board. In fact, it is a lot more "clone like" with regards to the BIOS and chipset, but it has a lot more of the "original" PS/2 features, like an earphone plug. There's even a place for a game port and a COM2 port.